An exciting experience during a visit to New Zealand is to walk amongst steaming fumeroles, bubbling pools, and a highly acidic lake and streams on White Island in the Bay of Plenty. A sometimes moody volcano it is actually a sub-marine mountain which rises up 1600 m above the seafloor, what we see of White Island is only the top 321 metres of that mountain. 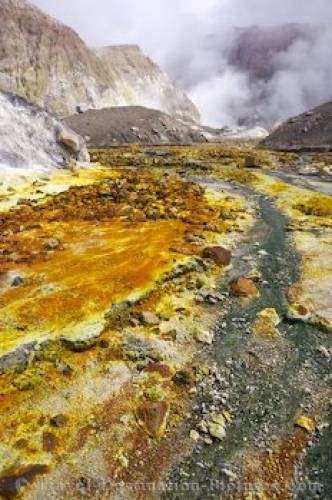 Streams and sulphur deposits are part of the landscape of White Island, an active volcano, Bay of Plenty, East Coast, North Island, New Zealand. active volcano in the Bay of Plenty, New Zealand.